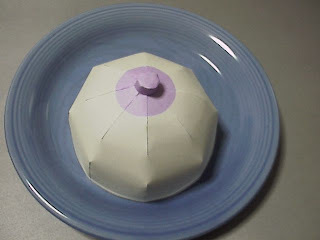 Here's a milk pudding papercraft that is shaped like "You-Know-What." This realistic (Androctonus crassicauda)scorpion papercraft has just been released. Fattail or fat-tailed scorpion is the common name given to scorpions of the genus Androctonus, one of the most dangerous groups of scorpion species in the world. Two new cute relax bears have just been posted. The first is a merman or should I say merbear? The other is Korilakkuma Kintaro version. Jonah Penne has just sent me a link to his television transformers papercraft. 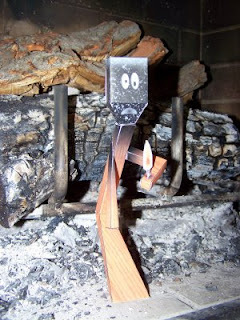 It's a follow-up to his washing machine robot that came out a few months back. These robots really transform. Check 'em out. Epona is Link's horse. 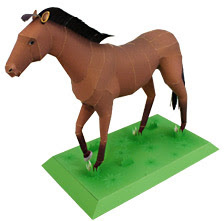 Epona is named after a Celtic Goddess of horses, and has a unique song, which is often used as a way to tame and/or summon her. In Ocarina of Time, Epona was born and raised at the Lon Lon Ranch and was personally handled by Malon. Kung Fu Panda is an animated film about a panda who learns martial arts and then uses this new ability to fight his enemies. The film will be released on June 6, 2008. 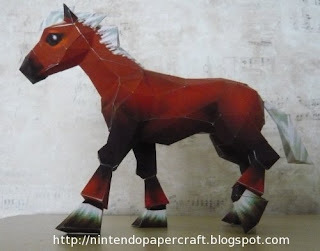 While waiting for that, build yourself these awesome papercrafts from hp. There's Master Crane, Master Mantis, Master Monkey, Master Po(panda), Master Tigress and Master Viper. Capcom's mascot Megaman or Rockman in Japan is the latest papercraft of Christopher Beaumont's growing hako collection. Here's a good-looking Ford Cobra car papercraft. It comes in a pdo(pepakura) file with fifteen pages of parts. 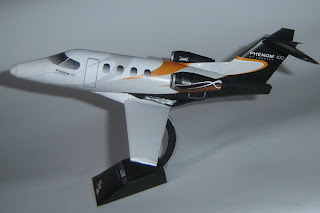 This model has a height of 12.1 cm and width of 32.6 cm. 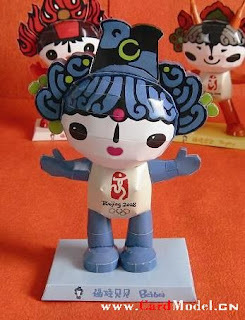 The Fuwa which means "good luck dolls" in Chinese are the official mascots for the 2008 Beijing Summer Olympics. The cute Fuwa group consists of five members according to the traditional five elements: Beibei, Jingjing, Huanhuan, Yingying, and Nini. Each of the five names is designed to look like a plausible name for a small child, while also achieving a more complex task: when the first syllable of each name is put together, it sounds nearly identical to the phrase "北京欢迎你 Běijīng huānyíng nǐ" which means "Beijing welcomes you". BeiBie which is currently available for download represents a fish. This model has five pages of parts. The other four papercrafts will be available on a monthly basis. I'll let you know when they're available. Toshiba TEC is a Japanese company that manufactures document processing and telecommunications equipment, motors, cleaners, health equipment, and compressors. They have ten different building models including restaurant, shops and others that will let you create a mini town. The Thoroughbred is a breed of horse first developed during the 17th and 18th centuries in England, by crossbreeding Arabians with native horses to produce superior racing horses.The Thoroughbred has been called the ultimate work of art ever produced by man, and has a height of around 160 to 170cm (to the shoulders), weighing between 450 and 500kg. Its well-developed chest and hindquarters make it a fast runner. It can run at speeds of up to 60 or 70km/h for minutes on end, even with a 50kg rider on its back.However, its thin legs are prone to injuries.In terms of temperament, it is a very delicate horse, sensitive to loud noises and bright lights. 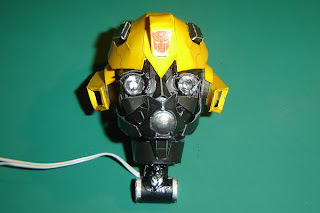 I have been eagerly anticipating Claudio Diaz's Bumblebee papercraft. Lots of people have been waiting to build this great looking model including me. Well, the wait is over. He just released the head parts. The arm parts are next. Remember the political finger puppets I posted a while back? Well, here's a new set that your kids will surely love. Download a penguin, a cute dog, two cats and a duck. 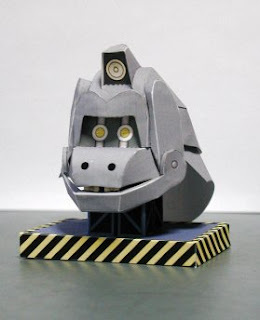 Here's a nice-looking robot head papercraft from King Kong Strikes Back. Did you watch the video? Nice, huh? That's the latest papertoy of Jun a.k.a. sonicscape. 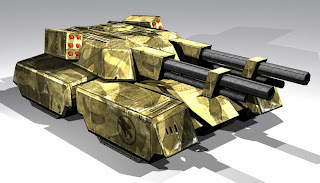 Here's a new tank papercraft from fico86. It's the Mammoth tank from the old game Command and Conquer Renegade. Niels' latest model is the Ariane 4(44LP) rocket. Ariane is a series of a European civilian expendable launch vehicles for space launch use. The name comes from the French mythological character Ariadne. The Ariane 4 is scaled at 1:96 with more than 200 parts and stands at 60cm high when built. The stages can be separated and includes internal parts. The payload section includes small models of the 3 satellites launched at the first flight. You can download Ariane 1-3 as well as his other space models. 888 is a lucky date and number for the Chinese and it is fast approaching. Epson Hongkong has posted some good looking olympic papercrafts representing the sports of weight lifting, archery, equestrian, sailing, kayaking, cycling, gymnastics and rowing. The shadow stormtroopers, sometimes called Blackhole stormtroopers because of their use under Agent Blackhole, were specialized Imperial Stormtroopers. The Keiō Line (京王線, Keiō sen) is a railway line of the Keio Electric Railway, however definition of the operator itself varies. Trader Sam of Disney Experience has a new free model for us. 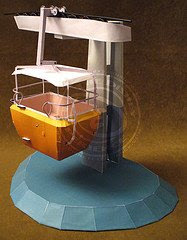 The Skyway Bucket is a gondola lift attraction at Disneyland. 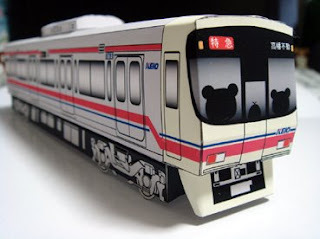 Here's a very simple tool shed papercraft from Tamiya. A bus is also available for download. Meet Grumm, a moody piece of paper…The designer of this urban papertoy got inspired by Spiky Baby by Shin Tanaka and Brickboy. The black one was designed by Brian Castleforte of Nicebunny. 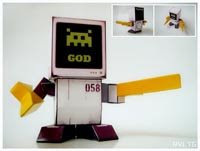 God and Evil- two simple papertoys designed by revoltage all the way from Indonesia. These are so cute! The white bear and the bird have been posted. 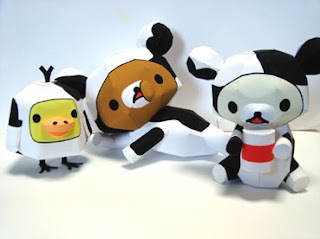 A relax bear box papercraft is also available for those who want it plain and simple. The Mazinger Z papercraft has seven pages of un-colored parts and stands at 17 cm high when built. 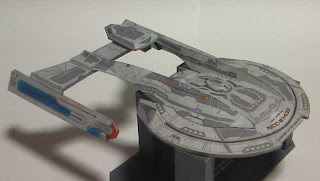 Here's a site featuring Wing Commander paper models. 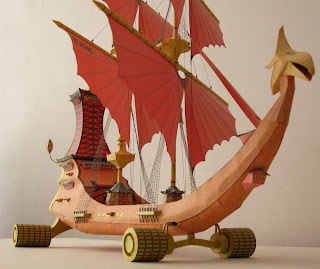 You'll find paper replicas of ships from this science fiction simulation video game. 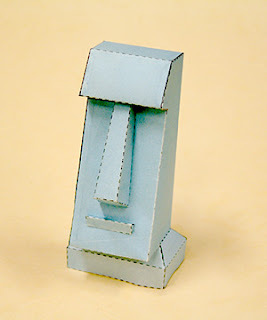 Here's a Zora mask papercraft from one of the best Zelda games, Zelda: Majora's Mask. Got a candidate in mind? Turn Barack Obama, Hillary Clinton and John Mccain into finger puppets and put 'em on your fingertips. Here are two fish papercrafts. I'm not sure what's the name of the first one but the second is called nekogigi (Pseudobagrus ichikawai), a species of fish in the Bagridae family which is endemic to Japan. 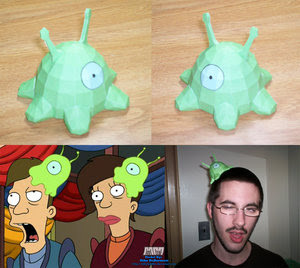 Here's a really awesome papercraft of Terrestrial Voyager. The design came from a book of an artist named Rodney Matthews. 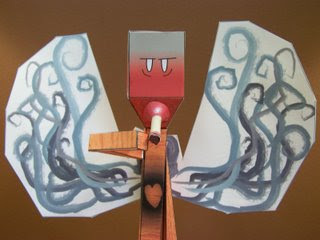 There are currently two papertoys available, the Original Sparky and the Punchline Sparky. More designs will come up so keepp checking this blog. It's been a long time since my last visit at Konica Minolta's site and they have added some animal papercrafts. There's the Geomyda(turtle), Mandrillus(Mandrill) and the realistic (Aquila chrysaetos) Golden Eagle. There are two models, the first is a colored but simplified version while the second is un-colored and a little bit complicated. The downloads are at the bottom.